I drink sparkling water, ice tea, and wine–almost exclusively. My penguin SodaStream usually does the trick, but since I discovered these skinny cans of Perrier, and I have been drinking little else. The hint of grapefruit is so subtle and yet so delicious. I felt it necessary to let the folks at Perrier know just how delicious. I recently discovered your pink grapefruit variety and have lost taste for all else–it is just so delicious! I’ve always touted the merits of grapefruit and often lament that it’s such an under-represented flavor. I’m glad we see eye-to-eye on this. Oh, and your skinny cans are perfection. They look so neat and tidy, all lined up in the fridge. Best of all, this grapefruit goodness has given my fiance and I a reason to reinstate cocktail hour. A shot of vodka, a splash of pink grapefruit and a paper straw, and you totally forget its a bone-chilling 37 degrees outside. And in the last days of February, a little of that goes a long way, so thank you. And cheers! Thank you so much for your kind words. You made my day! I’m thrilled that you and your fiance have discovered Perrier Pink Grapefruit in our sleek new slim can. 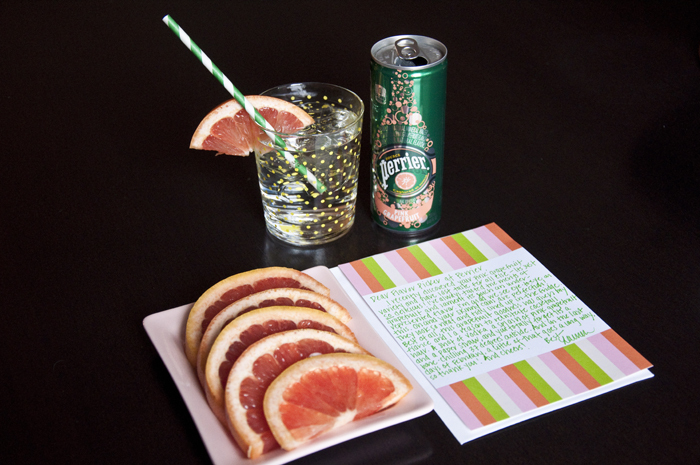 I couldn’t agree with you more that that Pink Grapefruit is Perrier perfection! I know you’re supposed to love all of your children equally, but Pink Grapefruit Perrier is by far my favorite (sorry Lime, Lemon and Citron!). And good for you for discovering the easiest, tastiest and lowest calorie was to indulge in cocktail hour. I am impressed! So impressed, in fact, that I would love to send you and your fiance a little Perrier gift package. Please let me know where I can send it, and please look for additional Perrier cocktail recipes at http://www.societeperrier.com.